Following the births of my three children, there was one thing that consistently did not happen: Me sitting down, at a table, for a meal. That I actually got to eat. With both hands. After getting home from the hospital (three-time c-section-er, here), I generally made a beeline for my bed and stayed relatively put for the next 48 hours. Nurse, sleep, diaper, up to pee, nurse, diaper, sleep, pray for poop while simultaneously dreading it, nurse, nurse, nurse, on endless repeat. But ladies, you NEED TO EAT. And you need to eat well, and regularly. If full meals aren’t happening or just sound too daunting or inconvenient, you’re going to need some good, hearty snacks on hand. 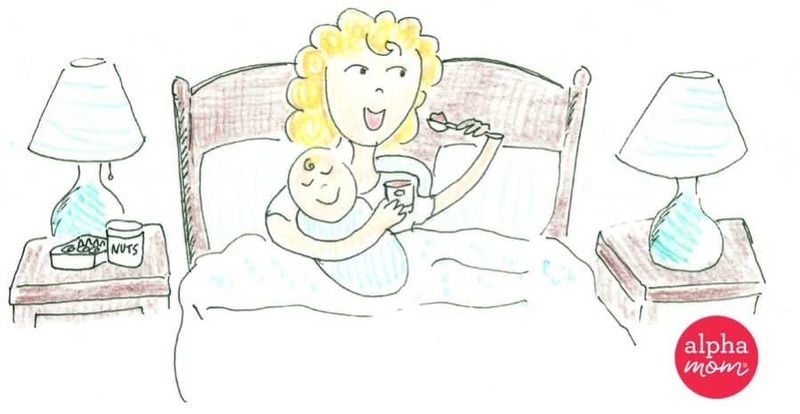 Preferably that you can eat with one hand, in the throes of new-baby multitasking. Dried fruit is a GREAT go-to snack, especially if you opt for the higher-fiber choices like peaches, apricots, pears, or figs. (And yes, prunes will also help get things moving.) Definitely opt for the unsweetened kind, they’re delicious and sweet enough as-is. I mean, obviously. Protein, healthy fats, and super satisfying/filling. You’ve probably got a favorite kind of nut or trail mix, so stock up and eat it by the handful. Spread nut butters on whatever you can eat with one hand and go to town. I ate a ton of whole almonds and probably even more peanut butter – my favorite hearty snack to this day is chunky peanut butter spread on a Wasa cracker or rolled into a whole grain tortilla with some honey or chopped up fruit. If you’re feeling ambitious in a still basically lazy way, you can combine #1 and #2 into just about any variety/flavor of no-bake power/energy balls. There are a million and one recipes out there but it’s really a pretty foolproof snack concept: take some nuts and dried fruit and roll up with your favorite nut butter and whatever else you feel like adding (oats, chocolate chips, honey, coconut oil, flax seed, cocoa, etc.) chill or freeze for an easy snack that’s wayyyyy cheaper than most of the packaged versions out there. If you’re in Trader Joe’s territory, pick up a bag of their Super Seed & Ancient Grain Blend to add a little texture and a ton of nutrition to your yogurt. Awesome smoothie topping too, if you’re the type of eater who isn’t fully satiated unless you’ve got something to chew. I mix it into my kids’ morning oatmeal and homemade muffins as well. I admit, the first time I saw a recipe for microwaved eggs I had a visceral OH HELL NO reaction. I’d honestly never even heard of microwaving eggs. They have to come out weird, right? That’s weird. I am perhaps one of the pickiest Egg People out there—my scrambled eggs need to be fluffy perfection or GTFO, my over-easy yolks need to be runny liquid gold nestled in a perfectly set white—but I have to admit that the microwaved mug omelet process results in a solidly delicious breakfast/lunch/anytime snack in a fraction of the time. I still make these several times a week, changing up the ingredient combinations based on whatever I have in the fridge. Grab a coffee mug. Spray the inside with cooking spray (or apply a thin coat of your favorite cooking oil with a paper towel). Crack two eggs, add a tablespoon of water or milk, season with salt and pepper, beat with a fork until combined. Then add omelet elements to your heart’s content: shredded cheese, salsa or hot sauce, diced lunch meat, tomatoes, peppers, spinach, whatever. Stir gently and microwave for one minute, then in 20 second increments until the eggs have set on the bottom. (My microwave needs one minute, 40 seconds exactly, others will vary so start with a minute and go from there.) Eat directly out of the mug or use a butter knife to release it onto a plate over some toast or English muffin. Okay, hear me out. This one might sound like a curveball after mostly straight-forward snack categories, but you’ll thank yourself later. If you’re currently in nesting mode and have run out of things to clean and fold and organize, go prep yourself some ready-to-eat Bento-style snack attack kits. If you’re newly postpartum and standing the kitchen with a baby in a sling or carrier, you can totally do the same in surprisingly little time. They don’t need to be anything fancy. Think turkey rolled up with some cheese and a side of bite-sized crackers. Some baby carrots or pretzels with a small portion of your favorite dip or dressing. Snack-sized plastic bags of different popcorns. String cheese, cherry tomatoes, Goldfish crackers for a finger-food sampler. One of those handy power balls and a yogurt cup (go ahead and include a spoon so you can grab it before leaving the house). Make a batch of hard-boiled eggs or those adorable little muffin-cup omelet things and prep your breakfasts for a week. Go for a mix of filling protein and carbs for energy, and only go for flavors/textures that you actually crave (i.e. if you’re always hungry 20 minutes after eating a salad then don’t waste time prepping a stupid salad!!) Assembling fun little flavor combinations is e both convenient and super excellent for portion control. I converted one of my vegetable drawers into a go-to Snack Drawer full of small plastic containers or bags – it let me eat a lot more variety than if I’d been forced to assemble meals/snacks from scratch every time, and also curbed my “I don’t know what to eat so I’ll just grab the bag of Goldfish and eat the whole thing” habit. Girl, please. You literally just had a baby, it’s okay to eat some cookies or chips or whatever. If you opt for even ONE of the snack options on this list you can absolutely find balance between that and something else that just makes you happy. I personally find everything I’ve talked about here genuinely delicious and satisfying, but I also really, really love chocolate ice cream and potato chips. And sometimes (particularly around six weeks postpartum when my hormone levels suddenly crashed through the floor), I was gonna eat the ice cream or chips. 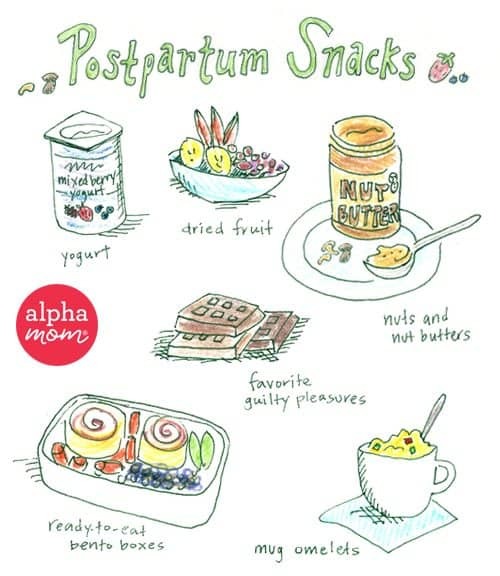 As important as it is to eat healthy while postpartum, it’s even more important to NOT fall into an overly restrictive (or even disordered) eating pattern, either in some misguided rush to lose weight or quest be the “perfect” breastfeeding mother. Give your body what it needs, but don’t forget to reward it as well, because it just finished doing something absolutely amazing!